Arsene Wenger granted an interview yesterday to Hong Kong Magazine Time Out and as has become norm these days his critics couldn’t wait for the ink to dry on the interviewer’s paper before tossing him in the shredding machine. Unsurprisingly, given the bent of even Arsenal fan’s to take swipes at him these days, the critics took on him for mouthing this ambition. What do they expect him to say? That he has a squad that’s only capable of fighting for a Europa league place and he’ll ensure that we fight hard enough to finish above all the other teams that will qualify in that category?Show me a General who leads an army into battle without the belief that he can win it and I’ll show you a lost cause. It’s usually so much easier to be critical than correct. I’ve heard people who have not as much as coached a junior league team question from Wenger’s substitutions in games to his training methods. I’m not saying he gets it right all the time but come on, the man is human. If you were in his position you will not get it right all the time either (I am assuming of course that his critics are human too). Is Wenger to blame for not paying over the odds for players? Maybe so in that he plays a big part in setting club policies and the general direction of the team but after all is said and done he is but an employee. Many times in the past he has openly spoken of his admiration for certain players who he knows will never be recruited by Arsenal because they fall outside of his budget. That’s tantamount to identifying these players for his wish-list and his employers have the option of over-ruling him and providing the money required for getting such players but do they? And who gets the stick at the end of the day? 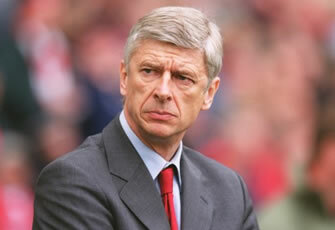 I think what Arsene Wenger has done at Arsenal is commendable. I make bold to say that there isn’t a manager alive who could have kept Arsenal competitive and in the Champions league places these past seven years given the resources he had at his disposal. Arsenal FC set “realistic” targets for itself based on its preferred “self-sustaining business model” since the move from Highbury to the Emirates. The debt burden of building the new stadium necessitated all kinds of policy changes, chief of which was to cut the salary budget by putting more emphasis on young up-coming players. That realistic target was ensuring a top four finish; winning the title would be an added bonus. I’m not saying this is right but it is what it is. These were business decisions that were made above him based on the self-sustaining model the club had chosen. Yes, he accepted these and has run with it because he believed it’s doable. He is an idealist that’s his only crime in all this. In his thinking he had only United to battle with as he had done for the past few seasons and he had no doubt he could better Sir Alex Ferguson from time to time armed with his ability to spot young talent. What he hadn’t reckoned on was the mad money the likes of Chelsea and City will come in with that completely changed the game. Coupled with his best players getting swayed by all the money on offer and leaving him in the lurch, he has struggled to build on whatever little was achieved the previous season. His true genius is that he has managed to stay in that top four position season-after-season without compromising the beautiful football that has won Arsenal the admiration of many while ensuring the club remains a profitable business which is more than can be said about rival clubs. My answer to that question is a resounding NO! Wenger and the team deserve our 100% support as we go into the new season. He had stubbornly held unto his ideals until criticized into submission as the signings of Arteta, Santos and Mertesacker last summer showed; and subsequently Podolski and Giroud so far in the present transfer window. There have been no raids on maternity wards for still-wet-behind-the-ears-juveniles. For this he deserves our support. Arsene Wenger is the last surviving alchemist; those people who have the uncanny ability to turn ordinary metal into gold. He's led us to victory before and he will do it again -soon. Whoa! It’s Friday. I’ve served you your daily and I need to go drink me some beer. NB-I succeeded in writing my piece today without mentioning that Dutchman's name. I am well on my way to recovery. Do rejoice with me.